These Seared Sesame Tuna Bites are so simple, so delicious and so beautiful. If you need a party nibble then these are the perfect quick canapé. The beautiful tuna is coated with a drizzle of sesame oil, dipped into sesame seeds and seared in a super hot pan so the sesame seeds form a delicious crust. Served with soy sauce they make the perfect quick canapé. And in my opinion when it comes to parties a canapé is the perfect party bite. Anything that means you can pick up a delicate piece of food, eat it in one bite and never have to put your glass down. PARTY WIN! The outside of these Seared Sesame Tuna Bites has a lovely sesame crust but the inside is still juicy and pretty much raw. So you need to ensure you buy sushi grade tuna for these little bites. Just ask your fishmonger about it. 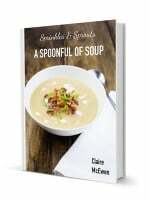 This dish takes minutes to make and can be served hot, warm or cold. Making it wonderful for a party. 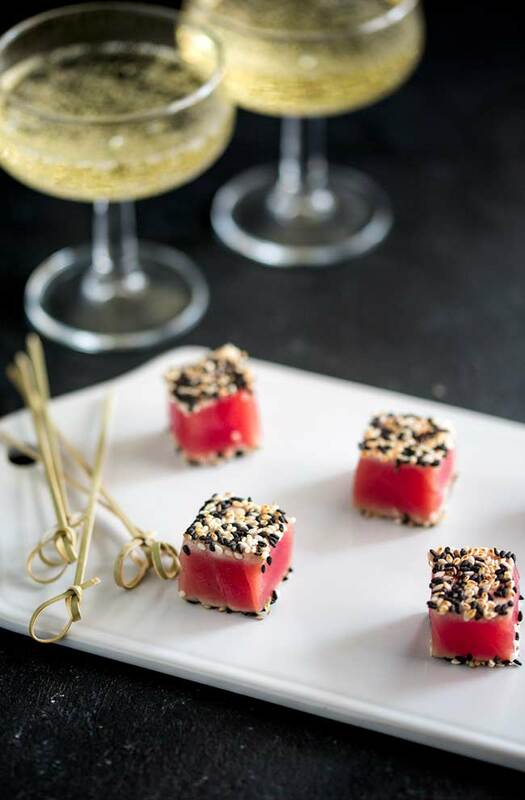 A glass of champagne, a seared sesame tuna bite and your guest will instantly feel welcome. I like to use black and white sesame seeds as I just love the colour combo on these Tuna Bites, but you can totally use which ever you have in the cupboard. Don’t add work by taking an extra trip to the shops! 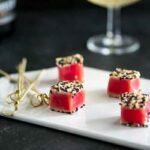 If you love this recipe for Seared Sesame Tuna Bites why not pin it for later. Place sesame seeds on a plate. And mix together if using white and black. Pour the two oils together in a seperate plate. Pat the tuna dry and then dip it or brush it with the oil mixture. Transfer it to the sesame seeds and turn to give it an even coating on both sides. Place a fry pan over medium-high heat, and once it is smoking add the tuna steaks. Cook for 30 seconds on one side and flip and cook for a further 30 seconds. Remove from the pan and use a super sharp knife to cut the tuna into bite sized chunks. Arrange on a serving platter with soy sauce to dip. Nutritional Information is based on 1 bite. 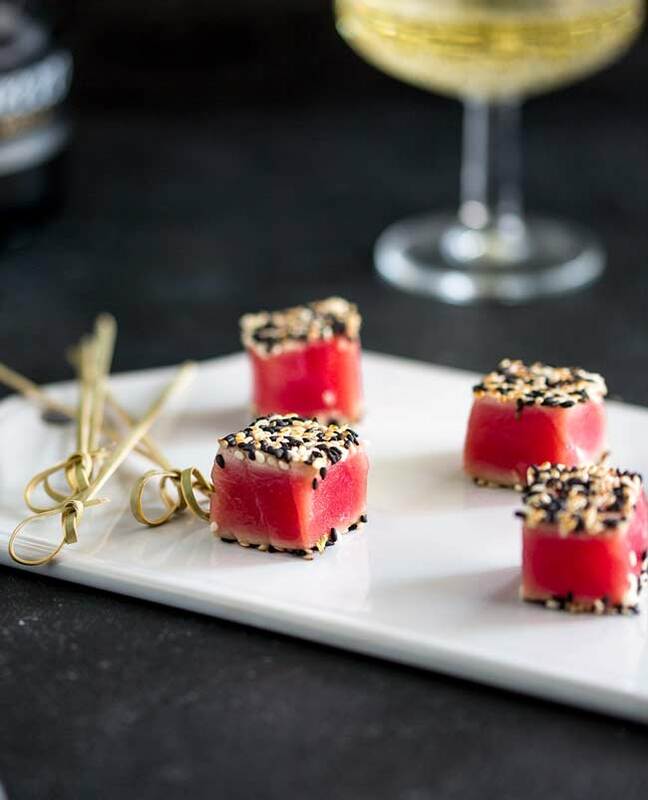 If you love food why not subscribe to my newsletter, I will drop you an email every now and then, just to say hi and send you a couple of recipes think you might love, like these Seared Sesame Tuna Bites. Such a great party recipe indeed! Pinned it to my entertainment board – too good not to! And i love the beautiful pink colour, totally gorgeous. 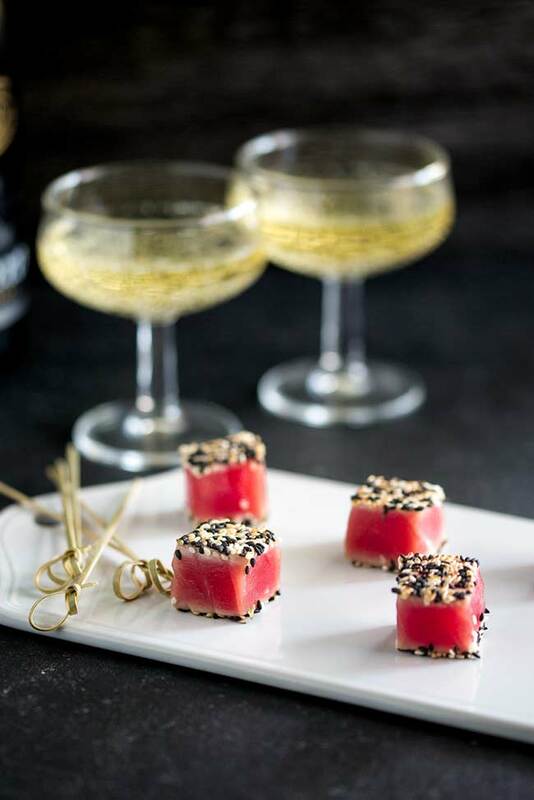 I love fresh tuna and these canapes are a perfect appetizer for any elegant party. Love how easy these are to make and they are so pretty on a platter. I find the key is to keep the steaks whole whilst you cook them and then cut them into bites once they are cooked. It makes it much easier to flip them and get them out of the pan quickly. They are always a hit, I think because the colours are so striking! How gorgeous and elegant! I love that combination of black and white sesame seeds for the crust.